Sofeminine at Spectacle Wearer Of The Year awards - all the goss! Home / Entertainment / News celebrities / Sofeminine at Spectacle Wearer Of The Year awards - all the goss! Spectacle Wearer Of The Year awards host Gok Wan told sofeminine that glasses have become “one of the most pinnacle parts of fashion”. And by the look of things he was right. Last night a whole host of British celebrities - and sofeminine of course - flocked to the Specsavers event at Battersea Power Station. 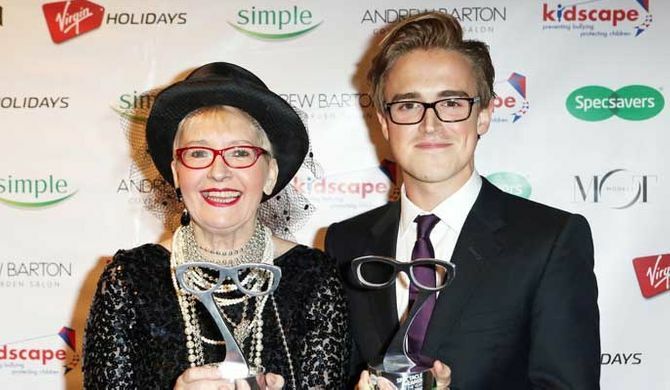 As well as celebrating stars who have specs appeal, the bash raised a massive £30,000 for anti-bullying charity Kidscape. Gok was joined on stage by former Coronation Street star Helen Flanagan, who was an ambassador for this year’s Specsavers awards. The 22-year-old turned heads on the ‘green’ carpet in a glittering low-cut emerald-coloured gown, accessorised with - naturally - a glamorous pair of glasses. The soap star was also rocking a shocking new tattoo on the inside of her left forearm, which looked almost identical to Transformers star Megan Fox’s body ink. Helen seemed keen to show off the large portrait of 50s Hollywood icon Marilyn Monroe, but she wouldn’t say whether it was temporary or permanent. She looked a little uncomfortable as she stood on stage with Gok to present the awards, often pulling up her plunging dress before standing with her hands on her hips. The evening’s prize for best female Spectacle Wearer Of The Year 2012 was awarded to an eccentrically dressed Su Pollard, who wore her usual eye-catching specs. 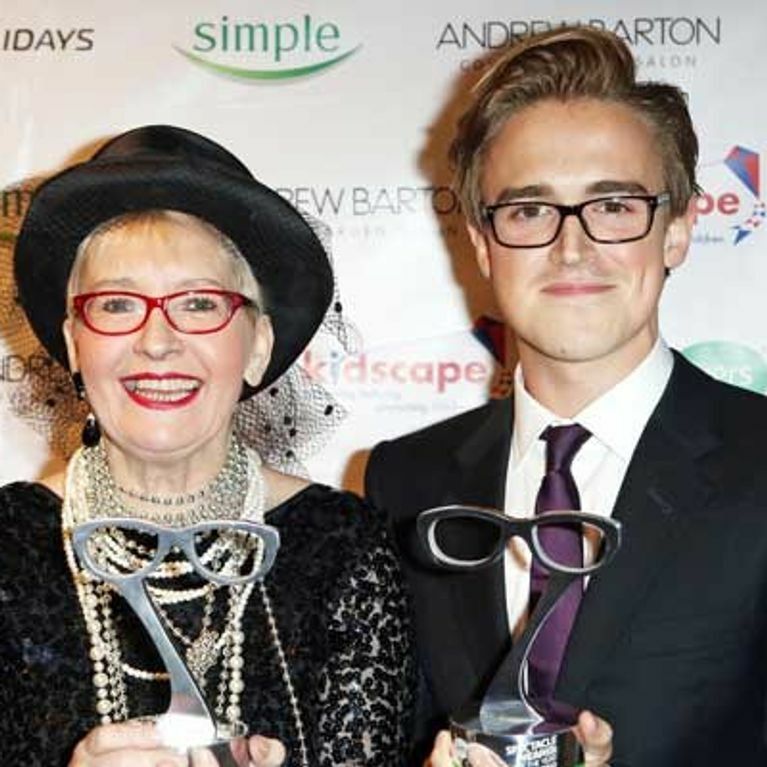 While McFly singer Tom Fletcher won for best male Spectacle Wearer Of The Year 2012 - and he certainly made sofeminine swoon over how cute he was with new wife Giovanna (the pair were even wearing matching glasses)! Also in attendance were Strictly Come Dancing stars Sid Owen and Ola Jordan, who got the boot from the competition last weekend (and we have to admit the pair looked pleased to be free from the pressures of performing on the BBC show). As well as former Corrie star Helen and ex-EastEnders actor Sid, other soap stars donned their favourite specs last night, including Tina O’Brien, Lucy Jo Hudson and Emmerdale’s Kelsey-Beth Crossley. Made In Chelsea's Oliver Proudlock and former X Factor contestant Marcus Collins looked particularly dapper as they flew the flag for specs-wearing reality stars. Proudlock brought along a gorgeous mystery woman to the event, who posed shyly next to the reality star. It was an Atomic Kitten reunion of sorts as a pregnant Jenny Frost and Liz McClarnon both showed up to the event. Liz looked to have lost a lot of weight in her cute shorts and was rocking a gorgeous new bob - we like! All eyes though were on Jeff Brazier - who attended with girlfriend Nicola T - in his electric blue trousers, though Gok made a cheeky comment that suggested he wasn't a fan of the fashion statement! Nonetheless, sofeminine thought Jeff rocked the best specs of the night...apart from Gok of course!